AKRON — Ohio Attorney General Mike DeWine, Akron Police Chief James Nice, Summit County Medical Examiner Lisa Kohler, M.D., and Akron Fire Chief Clarence Tucker on July 14 unveiled the forensic facial reconstruction of a man whose skull was found outside an abandoned home in Akron last year. 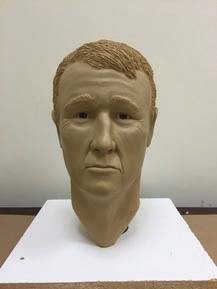 The clay model was created by a forensic artist with the Attorney General’s Ohio Bureau of Criminal Investigation (BCI) in an effort to help Akron authorities identify the man. “Someone out there knows who this man was, and we are all very hopeful that someone will see this model and notice a resemblance to a missing friend or family member,” said Attorney General DeWine. The man’s skull was found outside an abandoned two-story house at 1345 Marcy Street on January 8, 2016. Additional remains were later found inside the home, which had been damaged in a fire in 2012. The decedent is believed to have been a Caucasian male between 30 and 55 years old. He was estimated to be about 5’9” tall, but his weight, hair, and eye color are unknown. Items such as hairstyle are the artist’s estimations to complete the image and should not be considered significant markers for identification. Several items were found with the remains, including clothing, a belt, black shoes, and keys. More information and photographs can be found in this BCI Criminal Intelligence Unit public bulletin, which was issued to all law enforcement agencies in the state today. It is not known if the man was from Akron or another part of the state or country, so anyone who may recognize this person is urged to contact the Akron Police Department at 330-375-2490. This is the first facial reconstruction created by BCI in northeast Ohio, but the fourth reconstruction statewide. A Greene County Jane Doe was identified as a Florida woman following BCI’s creation of a clay model in December 2016. A Jane Doe reconstruction and John Doe reconstruction were created for two separate, still-unidentified cases in Marion County earlier this year. A video explaining the facial reconstruction process, involving 3D printing technology, and a time lapse video of the creation of the Greene County model are available on the Ohio Attorney General’s website. Information for this story was provided by the AG’s office.